Hi everyone. I just wanted to write a SHORT tutorial on Sega Master System emulation for a friend of mine who really wants to play Akai Koudan Zillion. He has this great story about how when he was a kid he was really into that game and he used to carry around the instruction manual until one day he lost it. Back in those days there was a toll number you could call and get hints on Sega games, and it wasn't a recording, you could talk to a real person. He called and asked them if they would send him a new manual and they said yes! For free even! So later he gets a huge package in the mail and they sent him a map of the game. He was stoked on this, but they sent him a hand photocopied stack of papers that was like the instruction manual for some golf game or something....It's funnier when he tells it. I always thought thought the Sega Master System was cooler looking in every way than the Nintendo Entertainment System. It was black and red instead of boring grey. It had cooler looking controllers, a cooler looking light gun, and the boxes were plastic instead of cardboard. Plus I knew alot of people with the NES, (myself included) but only like two people with Master Systems so they seemed rare...which also made them cool. 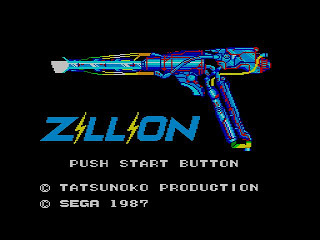 Anyways I never really got into Zillion, although I did like the way it looked. I was more of an Alex Kidd in Miracle World fan. We are going to Use the Kega Fusion Emulator version 3.63 today. So go download it HERE. The Fusion emulator isn't just a Sega Master System emulator though, it's also a Genesis, 32X, GameGear, and SegaCD emulator, but we are just going to worry about the Master System right now. This is a compressed file and will need to be extracted...if you don't know how to extract a .zip file we might as well go over it right now once and for all because it's really something everyone should know how to do. If you have Windows7 you should be able to right click your compressed zip file and extract it to its own folder where you can get at the contents. If not, you need to download a third-party program to extract your files like Winrar. I know this probably isn't very helpful but I have a hard time describing how to do this. If you can't figure this part out, message me and I'll try to help you more. In order to play a game you are going to need some ROMs once again, you can find them from your usual sources. They don't have to be in a special folder like MAME because when you go to load a rom it will ask you where they are everytime. So go grab yourself that Zillion rom HERE. This is going to be a zip file, you dont need to extract it, just remember where you put it! Now go ahead and run the Fusion.exe executable. Click on File, and Load Master System Rom. Navigate to where your zillion rom is and select it. And there it is.... you should be able to hear the super-chill music. There will be some little numbers in the bottom left corner, this is your frames per second. You can stop it from displaying this by going to Options and unchecking Show FPS. Go down to where it says master system, click on define and follow the direction to define your keys. Then hit ok and you should be all ready to play. A few things...If you want to save your game you can use the save state, under File - Save state. I don't know there's really not much else to it. This particular emulator does a whole bunch of cool stuff like letting you record the sound from your games into a high quality .wav file, record your games into an .avi file, and a bunch of other junk, so have fun playing around with it! I hope that all made sense let me know if you have troubles. If you want to take a screenshot it saves it in some random .tga file format. Get yerself Ifranview to view .tga files and convert them to other formats.